Jesus Christ spoke of his life and atonement as fulfillments of ancient prophecy. During his visit to the Americas, he quoted several Old Testament passages, all of which the children of Lehi apparently knew, to show how he fulfilled prophecy—and to explain to them their role as children of the covenant. For example, Jesus identified Lehi's descendants as those who, in the last days, will go among the Gentiles "as a lion among the beasts of the forest" (Micah 5:8–9; 3 Nephi 20:16–17). 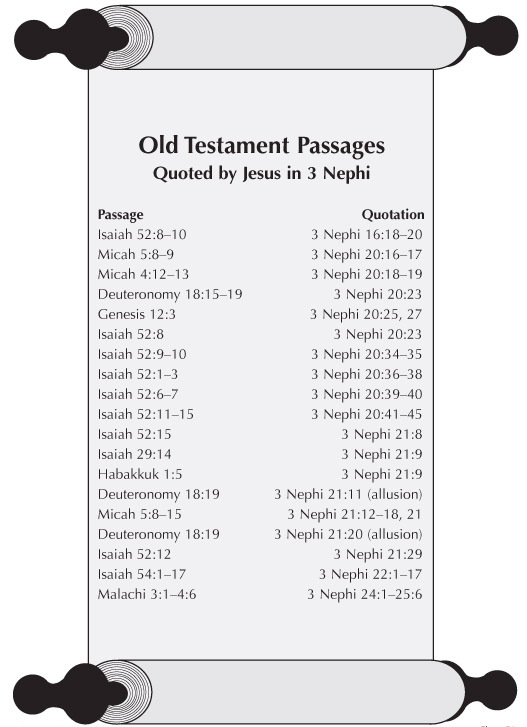 In this chart the Old Testament passages quoted by Jesus are listed in the left column, with corresponding Book of Mormon references listed on the right-hand side.